With each incoming H2H matchup there are plenty of roster decisions to be made. Many of free agents can’t wait to help you win. It only comes to your decision if/how to use them. How do you make such decisions? How do you find the most suitable free agent players and those to be replaced? Hot names? Schedule? Player rankings? 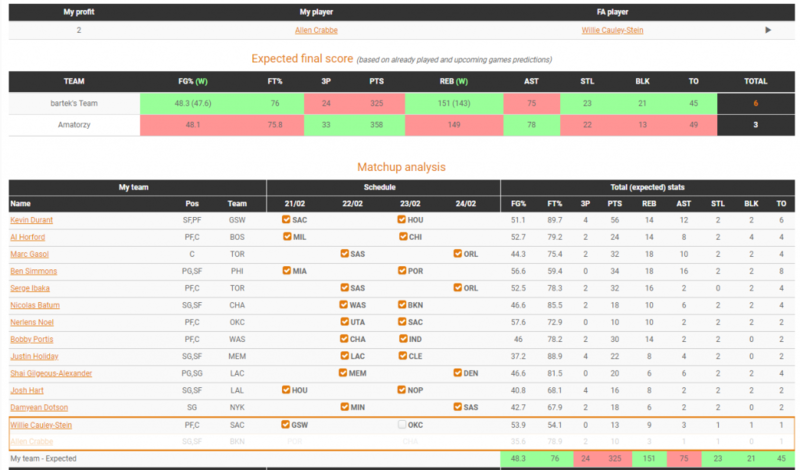 Matchup statistical profile?… Now you can use all of them packed into one tool. Ladies and gentlemen – please welcome the fb-ninja’s Free Agent Finder. No more wondering if the planned move fits into your matchup needs. 1. Select the week & stat sample period to see best possible fits. 2. Once you choose your favorite move you can further setup you matchup just as it was the regular Matchup tool! In Exptected Final Score module you can see categoriess you gonna Win or Tie because of that pickup. Free Agents Finder is part of our fb ninja premium tools, but you can sill try it for free.